Merrily We Roll Along may have premiered on Broadway back in 1981, and only made it through a total of 16 performances after its previews, but not a day goes by that Stephen Sondheim isn’t cursing and crying and turning and reaching — but mostly wishing the show had gotten a better reception. Merrily is the subject of the new documentary Best Worst Thing That Ever Could Have Happened, which premiered at the New York Film Festival last night in advance of a November 18 theatrical release. It focuses on the way the show’s failure affected the then very-young members of its original cast — including the doc’s director, Lonny Price — who had been specifically chosen to play characters that age in reverse over the course of the drama. 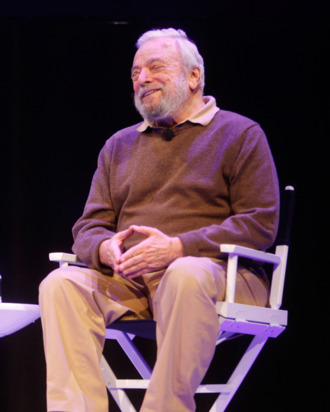 Sondheim believes that the critics were looking for a way to bring down him and collaborator Hal Prince, and said that the two felt “attacked” by the poor reviews of Merrily’s debut. “We were mavericks who were not starving, that’s a crime,” Sondheim said, further articulating on a moment in the documentary where he insists that people could accept poor innovators, and successful hacks, but not both. After the failure of Merrily, Sondheim famously broke off his partnership with Prince — the two had done Follies, A Little Night Music, and Sweeney Todd — and started working with James Lapine, leading to Sunday in the Park With George and Into the Woods. “I think it was just happenstance,” Sondheim said of the split. “Hal got interested in other people’s work, and I saw one of James’s plays and wanted to work with him.” He also noted that decades later, he and Prince did reteam on Bounce, which has also gone by several other names. Merrily has also undergone transformations of its own on the way to becoming a cult and critical hit, with new songs, a clearer format, and more than a few cuts, though Sondheim doesn’t mind. “It’s the show that counts,” he said. Most Sondheim fans could fill in the theater history without needing to watch a documentary, so Best Worst Thing wisely shines a light on the disparate fates of the members of Merrily’s original cast. It feels like a poignant, musical-theater version of the Seven Up! films, as Price checks in with former his co-stars, including Ann Morrison, Jim Walton, and Jason Alexander, all of whom were deeply affected by that big, unsuccessful moment on Broadway stage. Sondheim recalled how everyone was dewy-eyed, back at the original cast’s recording session, which took place just after the show closed. Watching Best Worst Thing, you’ll probably be dewy-eyed, too.